Don't fall victim to high-pollen counts. Here's what you can do to ease symptoms — and even prevent them altogether. 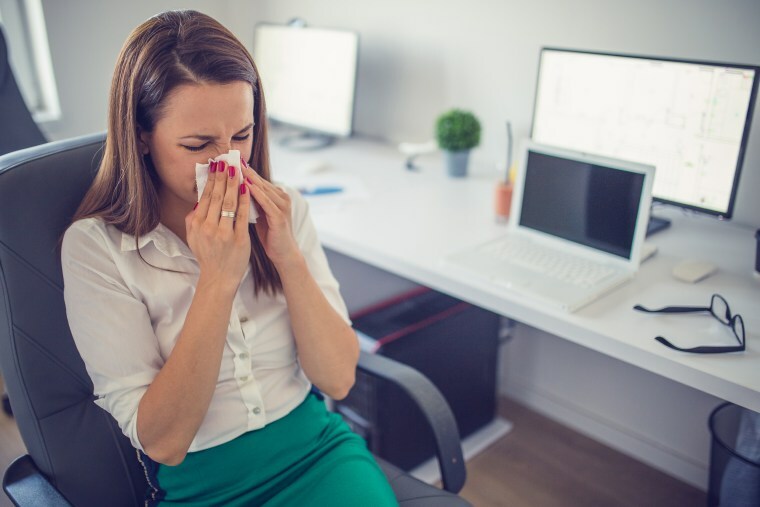 If you’ve spent the last few weeks sneezing, rubbing your eyes and going through boxes of tissues at your desk, you’re not alone. According to the Asthma and Allergy Foundation of America, more than 50 million Americans experience various types of allergies each year, and those that are prevalent during the spring make up a significant chunk of that. Seasonal allergic rhinitis (or hay fever) — an allergic reaction to pollen from trees, grasses and weeds — affects 6.1 million children and 20 million adults nationwide. And if your symptoms seem worse than previous years, it’s not all in your head. Fifty million Americans experience various types of allergies each year. Not to mention that year-round allergens like dust mites, mold and animal dander are still wreaking havoc. “People are still reacting to those year-round allergens in the pollen season, but now there’s extra allergen in the air, which can make their reactions even worse; it’s potentiating an already ongoing allergic reaction,” says Dr. Parikh. If you are suffering from spring allergies, when can you expect some relief? It seems that some of us may want to order that jumbo pack of tissues and hide indoors for the next few months. But taking the time to understand exactly what is going on inside your body — and how you may be able to combat it — may help you find some relief this season. So what exactly is happening in your body when you’re exposed to an allergen like pollen (and instantly feel your eyes well up and throat start to get scratchy)? So why are you dying a slow death at your desk, while your co-worker just has the sniffles? When you’re allergies flare up, you may be quick to assume it’s a cold, which is a logical assumption, since they present similar symptoms. But know they can also improve over time. “It can happen, due to environmental changes, but also hormones can have an affect," says Parikh. "So often after puberty, young boys will see their allergies and asthma get better, whereas the opposite happens with girls, unfortunately, because hormones also have an influence on the allergy cells in your body." Choose the right over-the-counter medications. "Generally, the over-the-counter options are a good start, especially the anti-histamine tablets and steroid nasal sprays, those are actually the safest over-the-counter options," says Parikh. Consider medication or allergy shots. "You can start with over-the-counter, but if it's not improving and your symptoms are involving your breathing, like coughing or wheezing or chest tightness, then you really should see a doctor," says Parikh. "We get the people who we know are very susceptible started on preventative medication before the season starts because that way they're less reactive to their outdoor environment. The immunotherapy or allergy shots are very effective because even with the medications, it’s just suppressing the symptoms; what immunotherapy does, is over time, makes you less allergic, so you won’t even need the medications because you aren’t reacting as strongly anymore." Adjust your exercise routine. “Wearing sunglasses and a hat can help protect your eyes from pollen, but these are temporary measures and it’s very hard to avoid it; it’s all round you," says Parikh. If your allergies are severe, "avoid outdoor, early-morning exercise because that's when the pollen counts are the highest. You may want to do evening outdoor workouts or take it indoors, Parikh says. Skip happy hour. “Alcohol makes all allergic reactions worse," says Parikh. "It increases blood flow to those areas of the body that are already inflamed, and also causes inflammation. Anything that causes inflammation in your body can make it worse — junk food, excess dairy — but alcohol is the only one that we know for sure worsens allergies." Pay close attention to breathing symptoms — and don’t take them lightly. “There is a peak in emergency room visits and hospitalizations during allergy season because some people get asthma attacks and have a lot of difficulty breathing," says Parikh. "We always stress not to take that lightly, even if it’s never happened to you before. You could of never had asthma before and have an asthma attack due to your allergies. A lot of times people think it’s only mild symptoms and it can be treated with over-the counter medication, but for some people it does create a large problem and we’ve seen the studies to support it with ER visits and hospitalizations."